"What will you do for your child? How far will you go?" For some time, Sunday has seemed like the exclusive property of premium cable series. Of course, there has always been scheduling to rival the HBOs, AMCs and Showtimes for the last night of the weekend, both NFL Football and Fox's animated comedies come to mind, but since pretty much all of their award winning dramas tend to air in that time-slot (like Game of Thrones, Mad Men, Breaking Bad, True Detective, etc.) it's sometimes easy to forget the network competition. And while Crisis won't be challenging them for any trophies, NBC's midseason release seems like the perfect mainstream alternative to the night's otherwise prestige programming. That reads like a backhanded compliment because, well, it is but that's better than no compliment at all, right? It could have been all backhand. I suppose another way to phrase it would be to call Crisis 'dumb fun,' not to mention a smart scheduling choice. While CBS chases the cable competition with something like The Good Wife, NBC has loaded up their (off-football-season) Sunday night with less-serious genre fare, pairing this 24-esque conspiracy story with the new JJ Abrams and Alfonso Cuarón sci-fi series Believe. That's also not to say that Crisis doesn't take itself seriously, it takes itself too seriously which is part of the aforementioned dumb fun. Created by Rand Ravich (Life), Crisis is about a group of domestic terrorists who kidnap the children of the world's most powerful people and then use them to achieve their (perhaps not so) nefarious ends. It's a pretty smart pitch because it has both episodic and serialized storytelling elements built-in to the premise. The series will play like a procedural with a 'kid of a week' story providing our odd-couple agents - Lance Gross' Rookie Secret Service Special Agent Marcus Finley and Rachael Taylor's FBI Special Agent Susie Dunn - with case to solve (or fail to solve) as the larger conspiracy unfolds around them. The pilot episode, directed by Phillip Noyce (Salt and the Harrison Ford Jack Ryan movies), is quick to get to the hijacking with the kids getting grabbed while going on a field trip for their rich prep school. It's a pretty slick opening ten minutes with Noyce choosing to use a lot of close-ups (often direct to camera) to get us to quickly identify with the characters and make the experience more intimate. It's also paced really well, the next plot point or twist coming fast enough to ensure that audiences don't spend too much time debating how silly Crisis can get, especially in the dialogue. At least NBC has assembled a solid cast to spout them. Gillian Anderson's Meg Fitch, an incredibly wealthy CEO as well as Agent Dunn's older sister, and Dermot Mulroney's Francis Gibson, a deadbeat dad who volunteered to chaperone the field trip, are the only parents introduced before the incident takes place but their roles play more into the larger story as Crisis, at least during the first two episodes (the pilot and "If You Are Watching This I Am Dead"), is very much Taylor and Gross' series. The pair have solid chemistry together and all of the adults are pretty compelling when on-screen. The teenagers? Not so much. But they are very good looking! So there's that. It's not like the acting really matters since the series is far more concerned with keeping you on the edge of your seat and constantly guessing than it is with getting you invested in the relationships. Or at least that's what I cared about. Every time Crisis took a breath to have a character moment, its weaknesses became way more apparent. It's already borrowed a bunch from 24 but adding a ticking-clock to keep the action moving forward wouldn't be a bad idea. I wonder if that's what prompted the show to stop and tweak some storylines? I hope it's not to add more time with the trapped teenagers. 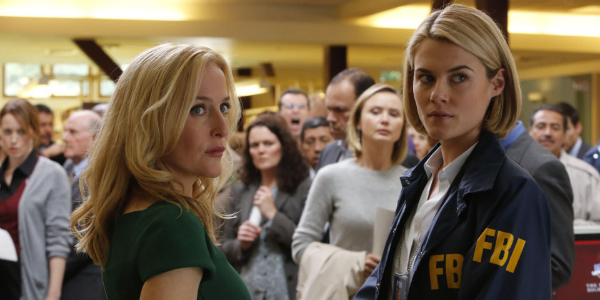 If they can keep the peddle down for thirteen episodes, Crisis could find a captive audience. Crisis premieres tonight at 10 p.m. ET on NBC. Created by Rand Ravich, the series stars Gillian Anderson, Dermot Mulroney, Rachael Taylor, Lance Gross, Stevie Lynn Jones, Halston Sage, Joshua Erenberg, Max Schneider, James Lafferty, Max Martini and Michael Beach.